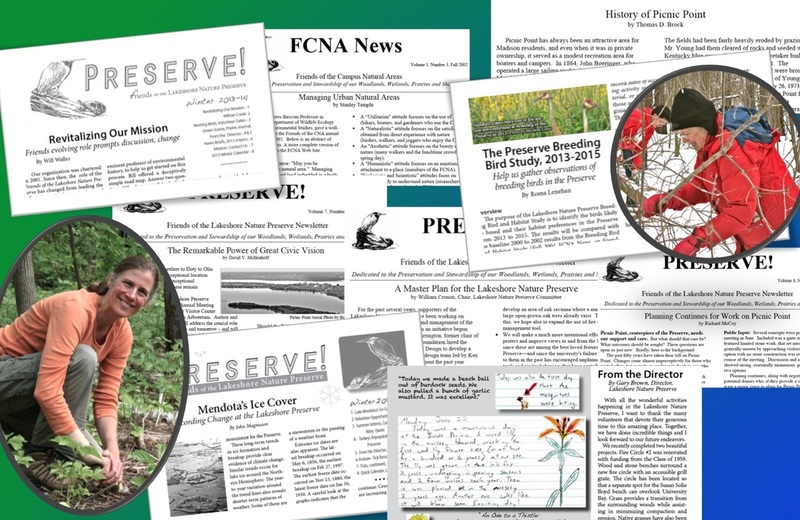 The Friends informative and educational newsletter PRESERVE! has been published three times a year since 2001. This newsletter, with articles written my many experts, chronicles the history of Preserve lands and development of the Lakeshore Nature Preserve. 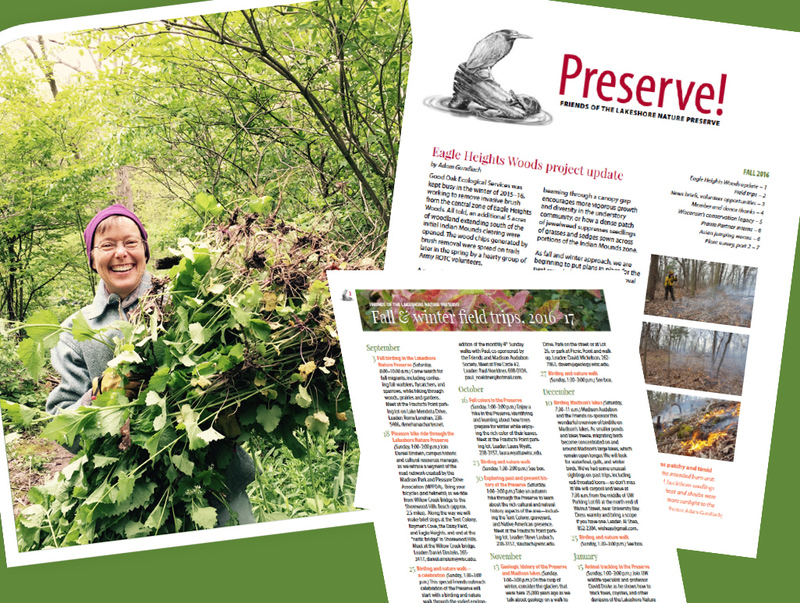 It tracks the progress made on the Friends projects in the Preserve, such as Bill's Woods,and it discusses the challenges encountered in Preserve restoration, such as garlic mustard and other invasives. PRESERVE! reports on recent events, field trips, and volunteer days and keeps you connected with the Friends and the Preserve. Ideas and announcements for our newsletter and website are welcome. To request space in our next newsletter, please tell us about your material. Please contact Linda Deith or Patricia Becker, the current newsletter editors. Linda Deith took on the challenging task of designing the newsletter of the Friends for the 2016 fall edition. Linda, who joined the Board in spring 2016, is working with editors Pat Becker and Sarah Goldenberg. A big thank you to Michelle Louis, who retired from the Board in spring 2016 after four successful years of the Friends newsletter designer. Newsletter editors Michelle Louis and Patricia Becker. The name of the newsletter changed from FCNA News to Preserve! in Fall 2005, when the Campus Natural Areas where renamed Lakeshore Nature Preserve. Roma Lenehan was editor until Spring 2012.